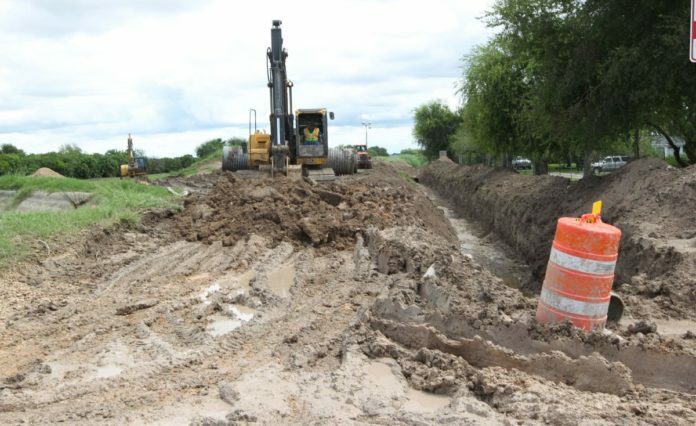 Hidalgo County Drainage District number one workers make a trench to install pipes on Rooth Road to connect to another ditch on Saturday, Sept.15, 2018, in Edinburg. EDINBURG — Nearly five months after heavy rainfall flooded thousands of homes in Hidalgo County, the drainage district’s $190 million bond to pay for costly upgrades to the drainage system was approved by voters. With all precincts reporting, the drainage measure was supported by 87,196 of voters while 42,095 voted no, or 67.44 percent to 32.56 percent. The Hidalgo County Drainage District No. 1 will borrow money to pay for 37 projects, predominantly in Precinct 1, the eastern part of the county, where rainwater flows through before it eventually drains into the Laguna Madre. “We’re excited about being able to help our communities,” said Hidalgo County Precinct 1 Commissioner David Fuentes, adding he is thankful voters put their trust in the drainage district to move quickly on the projects. During early voting and by mail, 96,279 residents in the district cast votes on the bond, 67 percent of those were in its favor, according to Hidalgo County Elections Department numbers released Tuesday night. Results also showed 13,305 people who submitted their ballots early or by mail did not vote one way or the other on the bond election. Residents living within the district, which encompasses a majority of the county, will see an increase in the district’s property tax rate to the tune of 3 cents per $100 valuation. Taxes will be raised to cover payments made to lenders — bond purchasers. The tax hike likely will not be immediate, according to the district’s General Manager Raul Sesin, who said it could be held off for a couple of years since the bond may be sold incrementally. District property owners may only see a half-a-cent tax increase at first, which will rise to three cents by the third year. The passage of the nearly countywide bond election comes after voters in the county twice rejected creating an additional district with taxing capabilities, most recently in 2016, according to Monitor archives. Some opponents of the hospital district pushed back on increasing the drainage district’s tax rate. In all four county commission precincts, Sesin and commissioners held a series of town hall meetings, detailing their commitment to transparency and reassuring local leaders and community members the monies will be used as disclosed prior to the election. “We definitely want to thank the people for the trust and believing in us, and we’re definitely going to be very transparent in our approach,” Sesin said Tuesday, a week after holding a news conference detailing the district’s commitment to using the money to complete the promoted 37 drainage infrastructure projects. The drainage district will allocate $15 million to its costliest project, the Raymondville Drain, according to pamphlets distributed at the district’s bond meetings last month. The district, within the next two months, will identify and publicly disclose projects it’s able to expedite, Sesin said.